Ask fellow campers about "Coastal Haven RV Resort" and nearby attractions. We stayed here in November. It's a very nice campground. We were in the site right next to the clubhouse. The office and the laundry ($1.50 for washers, $1.50 for dryers) are in the clubhouse. The site was long enough for our 36' class C and our pickup, but only if we disconnected it. The site was concrete and level. The people are very friendly. The location is perfect: close to both Gulf Shores and Mobile. We'll stay here if we're ever in this area again. We camped at Coastal Haven RV Resort in a Motorhome. This is a small park but an excellent place to stay. Our site was close to the exit and the road, but did not have any excessive noise at the site. We would stay here again when in the area. We camped at Coastal Haven RV Resort in a Motorhome. Nice little park. Rate reflects a weekly rate. Close to everything. Road out front is pretty busy, so there is some road noise. Streets are asphalt. Sites are concrete and very long. Mostly back ins, but a few pull throughs. Manager is very helpful, very friendly. Plenty of satellite room. Park is well lit at night to walk your dogs. 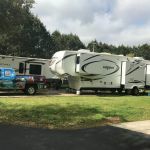 We camped at Coastal Haven RV Resort in a Fifth Wheel. Stayed a week, FHU worked well. Level concrete site, quite. Close to town but in the country - perfect. Enjoyed the park and will stay here again. We camped at Coastal Haven RV Resort in a Motorhome. Home to lots of full timers and seasonal guests. Not a lot of amenities like pool, playgrounds, etc, but that's not what we are looking for. Large pull through sites, all paved, good grounds keeping. If you are staying for longer than 4 nites, get the weekly rate, it will save you money over 4 nites, then just tell them when you are leaving so they can rent any remaining days to someone else. People are great, very friendly and helpful. If staying Nov thru 1st part of April, reserve WELL in advance as it will be full of seasonals. Very convenient to Fairhope and Cape Clear. The county road just outside of the park was undergoing reconstruction and replacement of a bridge, resulting in their normal entrance being blocked off, so it was a little interesting getting in, but the construction should be finished by end of April at latest. We camped at Coastal Haven RV Resort in a Motorhome. Additional parking available for toad if you have a REALLY oversized rig. Clubhouse was nice and well utilized by regulars. Laundry facilities were clean and adequate although we didn't use them (we have a W/D in our coach). Small lending library. We stayed here while participating in the Fairhope Arts and Crafts Show. Would definitely book again! This small, quiet, cash-only RV Park is convenient to Fairhope and surrounding areas. Mostly long-term returning residents were friendly. "Dog Walk" area was at the bottom and top of the park, but no real "dog walk" fenced area. Laundry worked fine, small washers but adequate and clean at $1.50 per load. Showers and private baths very clean. 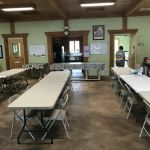 Central Clubhouse is a focal point for campers, who are a very social group. WiFi worked fine, at an average of 1 Mbps. No cable TV was available, so we used our Dish antenna. 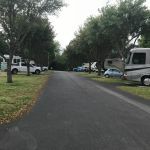 We camped at Coastal Haven RV Resort in a Travel Trailer. WalMart North of the park is very convenient and has a good price on Diesel. The town of Fairhope is worth a visit with many shops and good dining. If you want swimming pools, playgrounds, horseshoe pits, and such, this won't be your place. If, though, you want a quality RV park with good services, level spacious sites in a quiet, friendly environment, you will like this place. Utilities are properly placed and worked well. WIFI was one of the best we have encountered anywhere (we routinely use a signal amplifier). Many return snowbirds are friendly and inclusive. Location is a bit out of town, but that means it is quiet while still being convenient to services. Park is well managed and well maintained. Rate shown is the daily amount for monthly stay. We camped at Coastal Haven RV Resort in a Motorhome. Eat at Fish River Grill, Big Daddy's, Old 27, and Sunset Point. Catch sunsets on Mobile Bay. Take a trip to Flora Bama Bar and Marina and check out the big lady at Barker's Marina near Elberta. The sewer hook up was not standard. The entry pipe was too small for standard connections so we were unable to use sewer. I assume if we'd ask they had some sort of adapter but we discovered it in the morning when we were getting ready to leave and didn't feel like dealing with it. There was no picnic table. In backing in we discovered that there was a change in the angle of the pad so that when we unhooked, the truck was angled downward to the trailer. We camped at Coastal Haven RV Resort in a Travel Trailer. Nice park with level concrete pads. Good hook-ups with convenient location. ATT signal for cell good & good Wi-Fi signal. Location is close to Fairhope & 30 minutes from Gulf. Will definitely stay here again. We camped at Coastal Haven RV Resort in a Motorhome. The park is very clean and the bathrooms are the nicest I have seen. Great place to stay while visiting Fairhope and Mobile. The staff was very nice and helped us with our dog problem. We were so thankful for her assistance. Would stay here again and so should you. We camped at Coastal Haven RV Resort in a Fifth Wheel. Nice level paved pads with excellent power/water/sewer hook-up. Clean restrooms. OK cable, Wi-Fi. Nice quiet park with a many winter regulars. Convenient to Mobile, Gulf Shores, Pensacola. We'd consider wintering over here. We camped at Coastal Haven RV Resort in a Fifth Wheel. Very nice campground. Nice pads and interior roads. The host pleasant and helpful. Close to many things to do, yet a country setting. Wi-Fi worked great. This campground was a good value. We camped at Coastal Haven RV Resort in a Fifth Wheel. This is a very nice snowbird park. The park host said they are 90% full during the winter and are about 10% full in the summer. It is clean, well maintained and compact yet roomy. There are individual restrooms with showers which are secured by a keypad locking system. The pads accommodate big rigs easily. The are mostly back-ins but there are some pull-throughs. There are patio pads but the park doesn't want any clutter. Even though it is a snowbird park, we didn't see the usual setups and "stuff" around. There are no grills, fire pits or picnic tables. The daily rate went up to $30/night this year. We stayed 3 nights. The manager said the monthly rate is currently $400. I only rated it an 8 because there was no grill or fire pit. 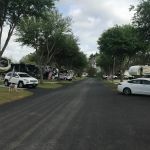 We camped at Coastal Haven RV Resort in a Travel Trailer. Are you affiliated with Coastal Haven RV Resort ?